Palmettos on the Bayou is a great place for a wedding in Slidell, Louisiana. Located on Bayou Bonfouca, near the old train station and Slidell's newly constructed marina facility, it features a pleasant rustic charm and beautiful scenery, and a walkway leading to a fairly large dock on the bayou, which is a great spot for a first look and portraits. This Texas couple had a fantastic wedding on a gorgeous October afternoon. After some fun bridal party shots on Canal Street, we headed over to beautiful Holy Name of Jesus Catholic Church in New Orleans where the ceremony was to take place. At the conclusion of the ceremony, the guests boarded buses to transport them to Palmettos for the reception. 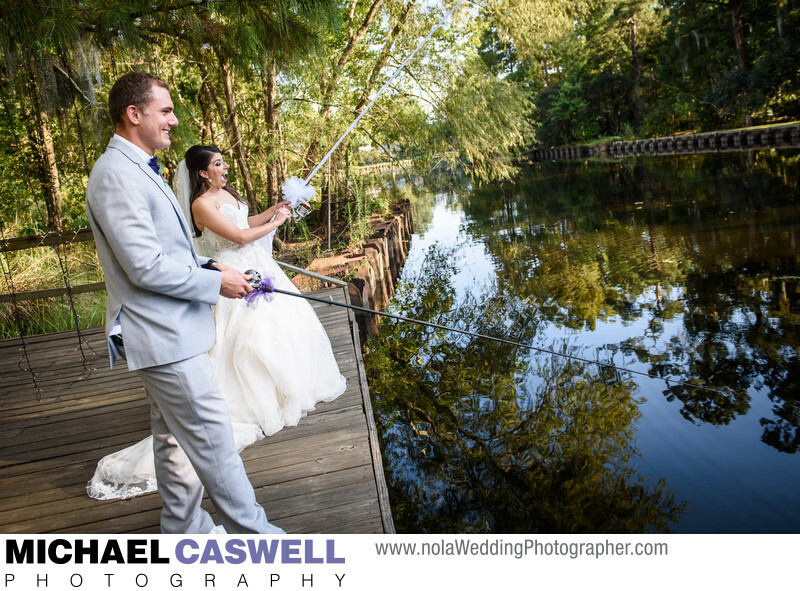 The bride and groom love fishing, so this venue's location on scenic Bayou Bonfouca made it the perfect choice for them! Upon arriving, they headed back to the restaurant’s private dock where they were to enjoy their first meal as a married couple, but first shared a “first cast” together with their his-and-hers fishing rods (adorably decorated with a tiny tux and a wedding gown) – they later caught and released a turtle! The event was expertly coordinated by Jennie Keller of Weddings in the City by Jennie, and Brittany with Palmettos did a fabulous job with helping to keep things running smoothly as well. At the end of the night, the couple was given a send-off by their guests with sparklers along the walkway leading back to the dock, and then departed down the bayou aboard the groom's father’s boat. While this couple chose to get married in a church, Palmettos can also host ceremonies on-site, which can take place under the huge oak in the outdoor area adjacent to the restaurant, or on the rear deck. Most of this deck area is covered now by a recently constructed roof, which takes away some of the worry of possible rain. In addition to this fantastic wedding venue, Slidell has other great locations for weddings, such as MovieSets: a Reel Venue, Trinity Banquets and Receptions, and Antebellum House. For larger indoor weddings, other options are the Municipal Auditorium, and the Northshore Harbor Center.